Gold-trimmed, walnut finish plaque. 10"x8" personalized with name, certification level, and certification date. Gold-trimmed, walnut finish plaque. 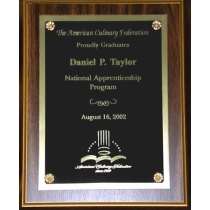 10"x8" personalized with name, graduation date and is for graduates of an ACFF apprenticeship program.